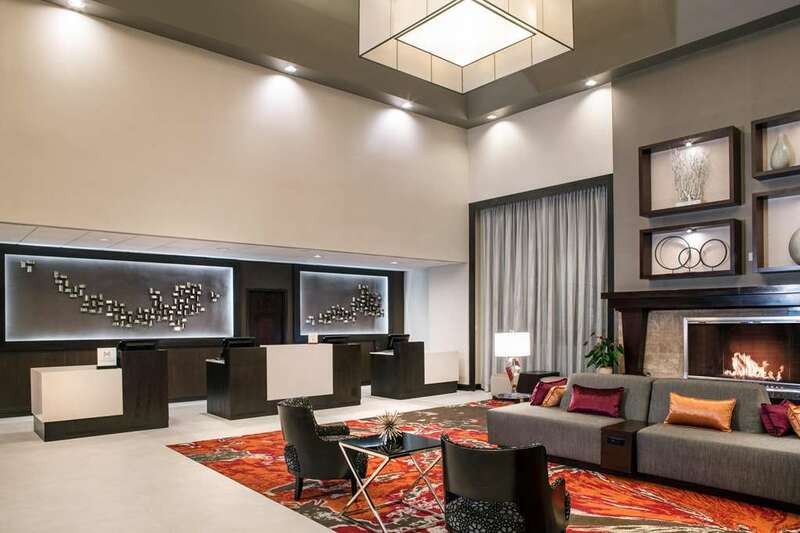 The DoubleTree Hotel by Hilton Denver Tech Center is located in the heart of DTC showcasing Rocky Mountain views from guest room balconies. Our hotel is just 10 miles south of downtown Denver Mile High Stadium Pepsi Center Coors Field and the Colorado Convention Center. Fresh sleeping rooms meeting spaces and public areas are ready to wow you following a recent renovation. Our totally transformed guest rooms and suites surrounding the soaring atrium lobby feature exquisite Sweet Dreams beds generous work surfaces two-line phones with data port and free internet access. After a day of meetings or 18 holes unwind in our full-service atrium bar offering a wide range of beverages and unique appetizers. You*ll experience superb Denver dining in our award-winning restaurant Zink KitchenBar. The cuisine is global with a Colorado flair and includes wood-fired flat breads and pizzas. This DTC hotel provides sparkling indoor and outdoor pools and a well-equipped Fitness Center. Enjoy complimentary transportation within a 5-mile radius of the hotel including top-rated shopping and dining options. Located near dozens of businesses and major corporations like IBM First Data Great West Life Schlumberger Newmont Mining and Ciber our hotel boasts more than 20 000 sq. ft. of flexible state-of-the-art Denver meeting space. Expect high-tech facilities for corporate events or your Denver wedding and allow our award-winning staff to make your event luncheon or reception memorable. Whether you travel for business Colorado skiing outdoor sports or to visit Red Rocks Amphitheater Park Meadows Retail Resort Cherry Creek Mall or Denver Coliseum our DTC hotel is close to it all. Dazbog Coffee Shop: Dazbog serves all types of coffees teas and refreshing beverages as well as many delicious pastries snacks gourmet croissants sandwiches and salads to enjoy during breakfast or lunch. In Room Dining: Stay in and enjoy a delicious meal in the comfort and privacy of your room with our in-room dining.